Following the success of their previous electronic music compilations Tron: Legacy Reconfigured and Star Wars Headspace, Walt Disney Records announced plans to release an album of Tomorrowland remixes curated by Grammy Award-winning producer Rick Rubin. The album, titled Not That Tomorrowland, will feature EDM tracks from today's top dance music artists inspired by composer Michael Giacchino's score, paired with sound effects and dialogue drawn from director Brad Bird's film. On the star-studded tracklist, Baauer contributes "Nix's Mix," featuring Hugh Laurie's iconic speach from the film, while Kaskade and Flying Lotus tackle songs inspired by comic shop proprietors Hugo and Ursula Gernsback, respectively. The compilation also features Tomorrowland star Keegan-Michael Key (under his Clarence alias) on "Audio AnimaPHONIC (feat. Jordan Peele)," as well as some homegrown Rubin production on "Athena Drop." 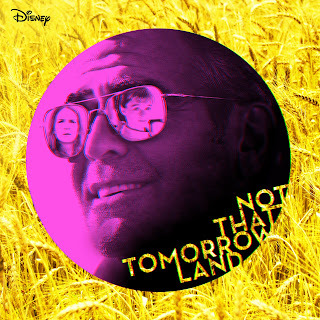 Not That Tomorrowland will be available via Disney Music Emporium on May 20, and on May 22 in stores. Fans can pre-order it here. I knew what day it was the second I saw the article was posted... but this was a bit crueler that last year's, 'cause now I want to know what these tracks would sound like. Somebody do this. It doesn't even have to be good. I just lack the skills and materials necessary to attempt it myself.